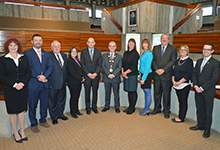 On September 26, 2017 residents of the City of St. John’s made their voices heard when they elected a new City Council for the next four years. The City of St. John’s conducts its election by mail. When the votes were all counted 38,491 residents voted; this was a voter turnout of 56.69 per cent. The next municipal election in the City of St. John’s will take place September 2021.